If the survivor can feel safe enough to express what happened into an empathic receptivity in the context of a trusting environment that does not retraumatize by skepticism and cross-examination, then the abuse, the boundary violations, and the perpetrations, begin to lose their force. Even if accompanied initially by strong emotions, as the survivor expresses her feelings and thoughts into the empathic listening of the therapist, the upsets begin to shrink. They start to shrink, and continue to do so with each iteration. The events begin to morph and change into something less confronting, monstrous, or compulsive. Even though language does not create what happened, language allows access to what happened. Language allows the speakers to capture the experience. And if the person can capture the experiences, including imaginary and psychic ones, the person can eventually release and lose them too. This is because describing and redescribing the event itself uses language that is semantically rich and ambiguous – inherently structuring and creating distances and distinctions. Though the violations may never entirely disappear, they becomes less menacing, intrusive, and disruptive. This model for recovery through dynamic psychotherapy is discussed in detail in Chapter Four of my book A Rumor of Empathy: Resistance, Narrative Recovery in Psychoanalysis and Psychotherapy (Routledge 2015). Once escape occurs, the recovery process can be engaged. 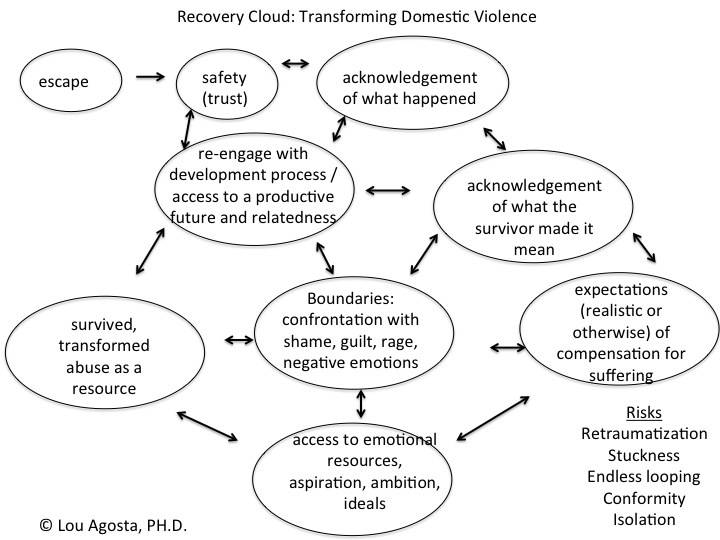 The tasks as depicted in Figure 2 (The Recovery Cloud: Transforming Domestic Violence) are decidedly not sequential. They are all simultaneously present on day one. They are all potentially engaged in parallel. Without exception, the relations are many-to-many. For example, there should be an arrow from the upper right, “confrontation with shame guilt, rage” to the lower left, “access to aspirations, ambitions, ideals,” but it would be too hard to read with so many connectors. Hence, the binary arrows. Even such relatively advanced aspects as reengaging the process of development are present on day one. To be sure, it is rare to have a breakthrough in such an area on day one, yet hints and possibilities – slender tendrils of new development – the forward edge – are present and are usefully engaged if they show up. A lot of survivors get stuck on Expectation (Real or Imaged) of Compensation for Suffering. For further conversation see the complete text or gave me a shout at aRumorOfEmpathy@gmail.com.